I know….I know….I’ve been MIA the last several days. I have been SO busy, I honestly haven’t even had time to sit down at the computer to check my e-mail. I’m down to 6 1/2 days of school, 8 days until I have to be out of my house, 9 days until I move and 32 days until the wedding. AAAHH. I have packed and packed and packed and still have a long way to go. I have been working on packing up my classroom and its a very slow process. I’ve only been teaching for 3 years and I’ve already accumulated SO MUCH stuff! 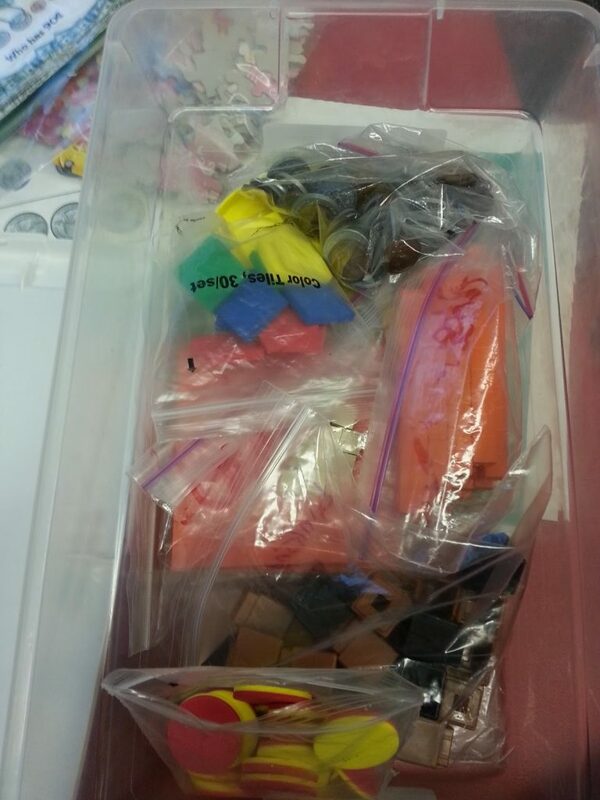 I started packing up our math tubs today and I wanted to share them with you. These are a time saver all year long. 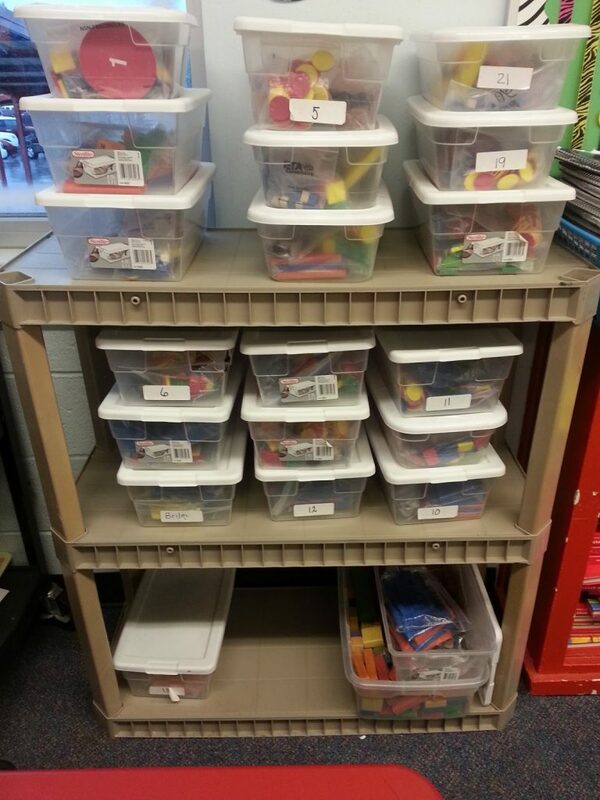 Each student has their own math tub marked with their number. Here is what they look like. 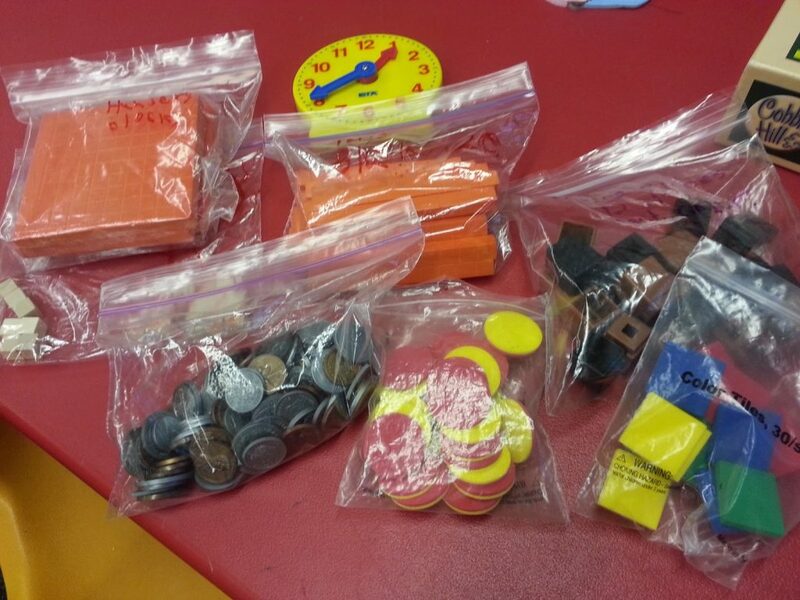 Inside each box, each student has their own individual set of base ten blocks, money, 2 color counters, linking cubes, color tiles and a Judy clock. I often add more or sometimes take some out. I have the amount of each manipulative written on each bag. If something is missing or a student doesn’t have enough, they know what they need to get from our shared supplies. I actually had my students label the bags. Saved me a lot of time. When we’re doing a lesson that involves a manipulative I just call out a number and they go get THEIR box. They are in charge of keeping up with their items. There is no “waiting forever” to count out manipulatives or no staying late after school to prep. We set them up the first week of school and during the last few weeks I have the students check their boxes and restock for next year! I love them! Now for some GOOD NEWS…are you ready? As you know, I’m getting married and have lots of new changes headed my way. A few weeks ago, after the big TPT sale, I posted how I was having a hard time with not knowing what the future holds as far as finding a new job. Well today my prayers we’re answered! I have a job for next year!!!! It all happened very suddenly. I applied for the job 2 Friday’s ago. They called me on Tuesday last week (a week ago today). I interviewed YESTERDAY. (I was so glad they we’re willing to work with my schedule considering I was interviewing for a job 4 hours away from where I currently am.) They called me today and offered me the job! AND…it’s 2nd GRADE!!!!! I get to keep using all of my fabulous materials. Now I have to refill my cart!!! I am so EXCITED!!! Thank you everyone for your prayers. All of the words of encouragement I received means so much. Now I get to start planning for next year like everyone else! YAY!!!! Now since I know ya’ll are so good a sending some prayers where they are needed. I’m going to ask to send some prayers to the state of Oklahoma. Especially Moore, and OKC. My finance’s family live in OKC and the entire situation has been very hard on everyone in our family. When the FIRST tornado touched down on Sunday, it hit about a block and half away from my future in-laws house. We know lots of people who live in Moore and surrounding areas that have been affected by this awful event. I ask that you pray for all of the families involved and bless the poor sweeties who did not make it. I cannot imagine being in that situation. It just breaks my heart. I felt blessed to hug my sweeties just a little tighter today.